Vodafone has announced that it will be using palm vein readers in its popular cell phone recharge truck that will tour multiple UK music festivals this summer. The system is designed so that with three taps on a hand reader, an individual’s identity is confirmed. The pattern of blood vessels in a festival attendee’s hand will be used to create a vein map that is unique to the individual. It will be stored when a festival attendee drops off a phone, and checked when that individuals comes back to pick the mobile phone up. The system is quick, completely safe and works even if a hand is clean, dirty or even soaking wet. The system will be used to accommodate the more than 2,000 mobile phones which can be charged on the truck at once. The device does not even get warm during use. 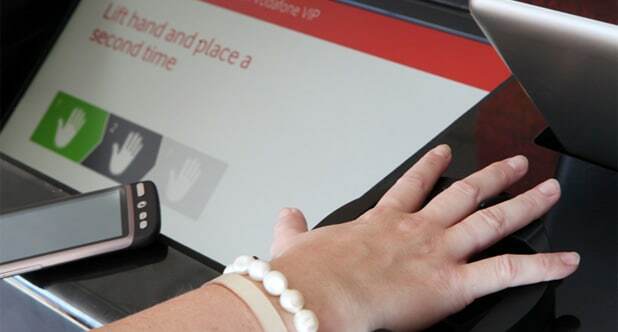 All festival attendees need to do is place their hands into the palm-shaped reader, and the Vodafone truck will identify that attendee using the pattern of blood vessels just underneath their skin. It is a slick system that offers top-notch security, avoids relying on wristbands, and even works if hands are caked in festival mud. To ensure the health of the scanner users, antibacterial wipes will be made available. Will you use the cell phone recharge truck at festivals this summer knowing you will have to submit to a biometric scan? Just imagine what inofomatirn they’ll want for your next passport in 2016 retinal scan, DNA sample, sound clip of you singing karaoke, where will they draw the line? !And those pics are proof you can never get a decent passport photo. Although with that haircut in the first one it’s no surprise!